Planning your wedding menu takes a lot of thought. Food and drink will play a big part in your day. They are also what guests remember most, almost certainly more than they will remember the flowers in the bridal bouquet. Tweat Up will help you make the right choices for you. 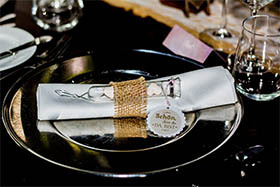 Your wedding menu is also likely to be your biggest expense, whether you want a formal seated dinner or a simple cocktail hour with hors d’oeuvre s.
There are a multitude of different catering options, and so many ways to make sure your personalities shine through in your menu choice, that sometimes it’s difficult to know where to start. This is where Tweat Up can help. The stand-out food item on your wedding will be the wedding cake. Whether you have a cake that is a traditional, elegant 3-tier affair, a pile of pastries one on top of another or 3 wheels of cheese layered on top of each other, we’ll help you get the cake that you’ve dreamed of. For many couples, a theme is chosen from which their wedding is to be styled. The wedding menu can complement this. For a Spanish theme, have your caterers prepare a Spanish paella for the guests. An unusual alternative to a barbecue, guests will enjoy seeing the dish being prepared and the smell will be as good as the taste. 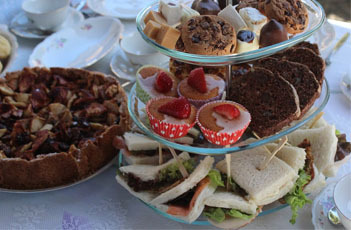 For couples getting married early in the day, a vintage style afternoon tea with sandwiches and cakes served on tiered cake stands with tea and coffee in china cups and saucers is an idea that works well if there is to be a barbecue later in the wedding celebrations. It’s also fun for those who admire the British style. Tweat Up also has ideas for seated dinners that follow tradition, but ideas too for a more informal family-style dining experience that will help get the guests at the table talking with each other. For those couples who want to bypass the formality of being sat at dinner and would rather spend more time dancing and partying. We have buffet ideas to suit all ages. 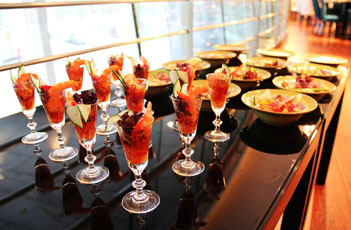 Also included are suggestions for drinks for every occasion and how they can be served. Last, but not least, Tweat Up has ideas for your cocktail hour for you and your guests at any time of year that will suit a range of budgets. Feel free to contact us with any concerns you may have, questions, comments, ideas. Share with us photos, videos and thoughts - We're Always Happy To Hear from our visitors and clients.